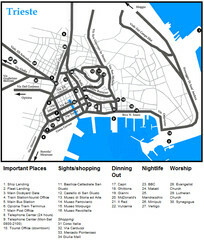 Tourist map of Koper, Slovenia. Shows 55 tourist sights. Parking places in Izola (blue sign - payable parking, white sign - free parking). City map of Trieste with projects plans. 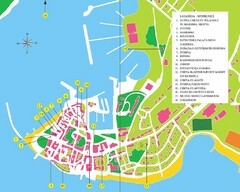 Tourist map of Umag, Croatia. Shows restaurants and lodging. Tourist map of Novigrad, Croatia. Shows points of interest.